Kutubu Kundu & Digaso Festival is hosted at Daga Village, Kutubu, Papua New Guinea. This is what the team "Kutubu Kundu & Digaso Festival" is up to now despite the Earthquake Disaster which costs their lives, homes, gardens etc... "Yumi Yet Mas Kirapim Bek Yumi Yet" will be theme for this years festival 21-23 September in Kutubu. The Festival is the only which benefits the communities directly from activities performed, individuals or groups that participate, from selling of products like arts/crafts, accommodation services, meals, transport, etc. All these avenues will help the communities to at least start opening doors for more of outside help. The Daga Community led by their two ward Councilors from Fiwaga and Damayu are now working closely with the PNG Government authorities on the ground and NGO's, Churches and Youth Groups to bring about gutpla sundaun long komuniti blong ol. 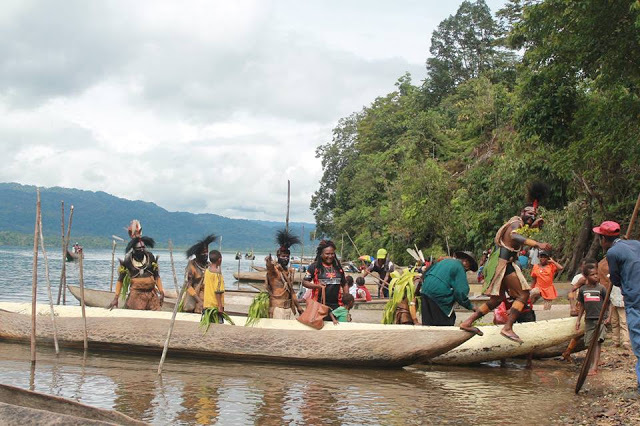 This year's Canoe Racing at the Lake Kutubu will be centered at the Lakeside. Specific venue of the race will be confirmed soon once plans are finalized. WE thank our leaders who are always behind us the team and communities to at least recognized the efforts put to ensure such significant events in our local communities so that the local communities can benefit directly from these activities.